Description: This unusually shaped sea anemone lives almost exclusively on the hermit crab Pagurus prideaux with its very wide base wrapped around the crab and its shell. Colour is white, shading to chestnut below, with pink spots (rarely absent). Emits numerous pink (rarely white) acontia when disturbed. The disc and tentacles are always situated beneath belly of crab. Habitat: Found on gravel, sandy, or stony bottoms from 0-200m, rare on shore. Distribution: Occurs on all coasts of the British Isles and west Europe. Fairly common. Similar Species: Unlikely to be confused with any other species. 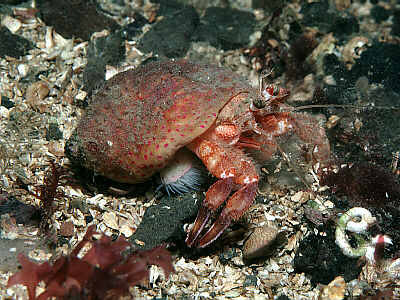 The only other British anemone habitually associated with hermit crabs is Calliactis parasitica which has a more 'normal' anemone shape and different coloration. Broad base wrapped around hermit crab. White column with pink spots. Picton, B.E. & Morrow, C.C. (2016). Adamsia palliata (O. F. Müller, 1776). [In] Encyclopedia of Marine Life of Britain and Ireland.